The company appointed Hertzfeld as the design leader for Google+, which was codenamed "Emerald Sea." Given that Google is known for its stripped-down design ethos, Hertzfeld has at times felt "constrained," Steven Levy reported for Wired. According to the report, Larry Page, co-founder and now CEO of Google, is notorious for despising "swooshy" designs and animations. But, the new Google+ interface, especially the Circles social grouping feature, contains animations and other choices reminiscent of Apple's design ideals. "With colorful animations, drag-and-drop magic and whimsical interface touches, Circles looks more like a classic Apple program than the typically bland Google app," said Levy, author of the book "In The Plex: How Google Thinks, Works And Shapes Our Lives." Hertzfeld admitted to having taken a risk with the Circles design.It wasnt a given that anyone would like what I was doing, but they did, he said. Ive heard in the past that Larry Page he didnt like animations but that didnt stop me from putting in a lot of animations in, and Larry told me he loves it, he continued. Maybe Apples resurgence had a little bit to do with it." Google+ appears set to challenge rival Facebook, the current king of social with 750 million monthly active users. Earlier this month, former Google CEO Eric Schmidt admitted that he "screwed up" by not pushing harder to compete with the social network. The Mountain View, Calif., company is touting new Google+ features such as Circles, Hangouts, Instant Upload, Sparks and Huddle. 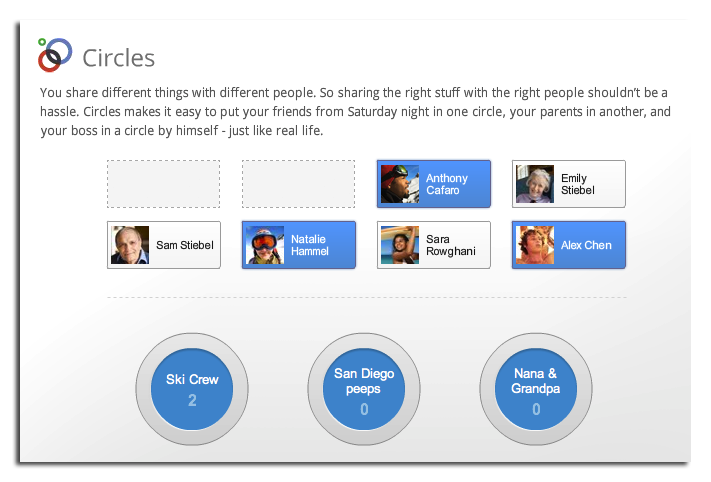 Circles allows for easy grouping of and sharing with friends of family. 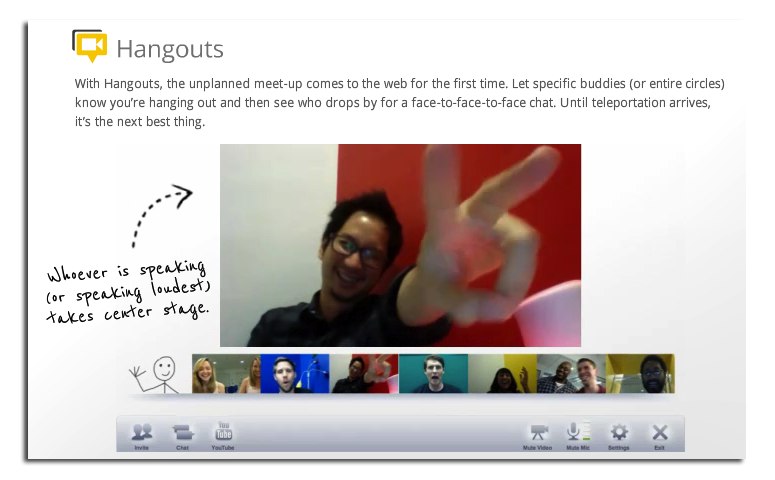 Hangouts bring the "unplanned meet-up" to the web with group video chats. The Instant Upload feature automatically uploads photos and videos from Android devices to a private Google+ album. Sparks tracks a user's interests and recommends content it thinks he or she will like. Finally, Huddle is a group chat feature. Google launched the service Tuesday with an invitation-only "limited field trial" period. The company also released a Google+ Android client on Tuesday, and promised an iOS version is "coming soon." In addition to the Google+ announcement, the company unveiled redesigns of its core search page and mobile website. The new search page features a now black menu bar, while the mobile main page now sports a "drawer" with links to commonly used sites, individual search types and web apps.